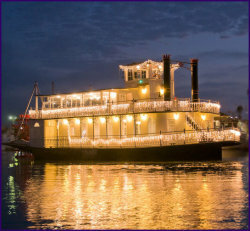 The Scarlett Belle is a modern riverboat located in the scenic Channel Islands Harbor. The boat can accomodate from 40 to 150 passengers and is a fun, luxurious venue for weddings, parties, corporate events, anniversaries and more...casino nights, graduation parties, public holiday cruises, etc. For more information, visit www.scarlettbelle.com or call 805.204.0977. Located at A&M Boat Charters & Cruises at the Marine Emporium Landing at Channel Islands Harbor, 3600 S. Harbor Blvd., #219, Oxnard. Exit the 101 freeway at Victoria, proceed south on Victoria, at West Channel Islands Blvd, turn right. Go to the second stop light and turn left onto Harbor/ W. Channel Islands Blvd. Go to Cabezone Circle make a left. Into the Marine Emporium. Walk to the back of the three buildings facing the street to the dock where you will see the Scarlett Belle and Sunfish. Free parking.